RELIEF OPERATION – TYPHOON HAIYAN. Almost a year after Typhoon Haiyan struck the Philippines, the global Red Cross network helped families rebuild as part of an ongoing and coordinated effort to ensure people have the right help at the right time. The storm tore through the Philippines in November of 2013 with record strength winds and high storm surges. Archangel Trust was there to distribute food and essential items to the victims affected by the Haiyan Typhoon. The eastern part of Samar is an area that was seriously affected by the Typhoon Haiyan. Most of the baranggays on the islands were hardly given relief; thus their livelihoods were in total ruin. These remote areas can only be reached by small boats from island to island. Archangel gifted these fishermen with boats to help them with continue with their livelihoods through fishing and microenterprise activities. 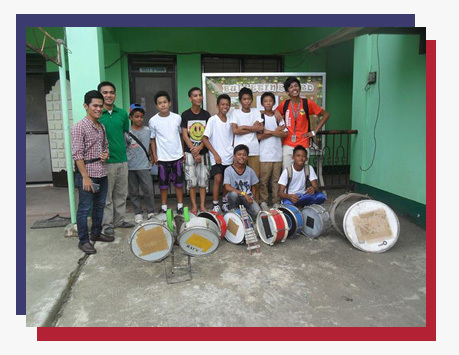 In August 2014, Archangel donated a complete set of band instruments to the marching band of MacArthur National High School, Leyte, Philippines. Archangel Country Director, AldwinSacan, was graciously greeted by the school children and high students who performed one of their signature marches.